Strawberry season is just starting here in Ontario and I got a lot of strawberries on the weekend. My grandmother used to make strawberry jam and I have had a craving for homemade strawberry jam for a while now. boil. A hard boil being a boil that does not stop boiling when stirred. (I learned something new.) It tastes great though! 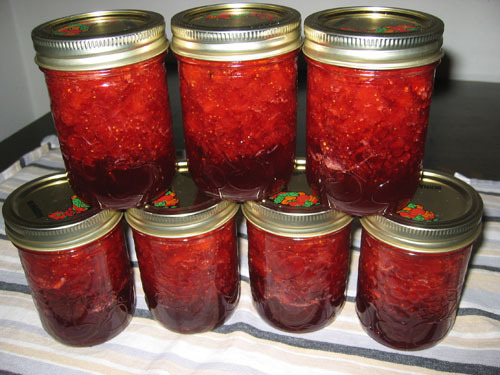 The recipe made a lot (7.5 jars), so I have a supply of strawberry jam to last a while. Bring the strawberries and pectin crystals to a boil with high heat in a large pot. Kevin – I love that you get to see big chunks of strawberries in your jam. I have not yet embarked on making any jam but may do so when I am back on US soil where figs are coming into season. Homemade strawberry jam is great! The sure-jel freezer jam is nice as well..and a little easier to do. I am really enjoying the homemade strawberry jam. One of the good things about making your own jam is that you can make it as chunky as you want. I am now looking forward to fresh local blackberries and blueberries. I will have to get some more jars! 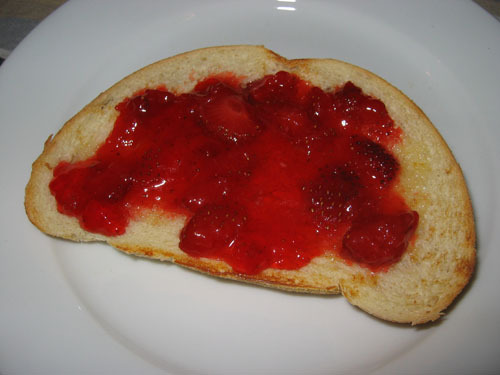 Kevin– I made traditional strawberry jam without pectin. I had so many leftover strawberries, that I decided to roll up my sleeves and make strawberry-balsamic jam. This is only my second time making jam, and I this turned out perfectly! I used pectin, this time. I think the trick (for me) was having the jam at a rolling boil for about 10 minutes. I froze a plate and when the jam seemed to sheet off the spoon, I put a little on the plate and ran my finger through it. It separated and this means it was ready to go! OMG! You're right– the balsamic gives a whole new dimension to strawberry jam. My hubs can eat the regular, but this version is all mine. I'll blog about it in a few days. A Feast for the Eyes: The hard/roiling boil is the important part. I will have to try the frozen plate trick next time. Thanks for the tip. I agree with what marye and Amy said about the freezer jam… That is what I use for my homemade jams, and it is SOOOO simple! Just mash some berries, mix with the pectin and sugar, let sit for a half hour, and Presto! I even decrease the amount of sugar in my freezer jam, so that it's not so coyingly sweet. I can't remember what the rule is now, as it's been a few months since I last made it, but I believe you can decrease the sugar by half without any problems. This way, you get even more of the fruit flavor and it's tastes so fresh and light! YUM! !